On the night of 31 March 1986, Hampton Court Palace caught fire. The great state apartments, built by Wren, were ravaged, but a decision was at once made to restore them to their original condition. The Historic Royal Palaces Agency has decided also to restore King William Ill’s Privy Garden, which was laid out with the Palace. For the first time in two hundred years it is possible to view the facade of Wren’s palace as it was meant to be seen. Originally the garden was designed to provide a view of the River Thames and the trees within it were clipped to a height of about 7 or 8 feet. Yet over the years, they were allowed to grow untrained and with other planting the garden began to resemble a thicket, so that the palace became invisible from the river. Following the clearance of its vegetation, the garden has been fully excavated. The exact positions of paths and lawns have been identified in addition to the location of former steps and statue bases. Even more remarkable is the discovery of the original flower beds where trenches had been dug into the river terrace gravel to accommodate good quality soil. The Privy Garden has a long history. It was originally created for King Henry VIII, as part of a triangle of ground between the palace and the River Thames. To the west was the Pond Yard where ornamental pools were stocked with freshwater fish for the kitchens. To the east all types of game roamed in House (later Home) Park. Between these two ‘larders’ were the Privy Garden and Mount Garden, so named after a central mound with a banqueting house at the summit. A long building known as the Watergate linked the ensemble with the river and provided access not only for the King but also for important courtiers and foreign visitors, so that views of the Privy Garden would have been amongst their first impressions of Hampton Court. The Tudor garden was a heraldic garden with beasts on painted poles. This foundation for one of the towers was only preserved because it lay under the East Terrace. A tree pit dug later for topiary cuts into the floor on the left. This was a ‘heraldic’ garden, laid out like a chess board, with individual squares filled with red brick-dust, white sand and green lawn. There were bushes, made into topiary that was clipped into human shapes and mythological figures. The whole was dominated by heraldic beasts on painted poles, designed as a display and reminder of royal power. During the seventeenth century the heraldic garden fell from fashion and the Privy Garden was several times restructured. The major change came with the revolution of 1688 and the accession of William and Mary when a great period of building began at Hampton Court. The old palace at Whitehall fell from favour: the lack of privacy within the open-access buildings did not appeal to the new monarchs who were used to less bureaucracy and a much smaller household, largely of loyal and devoted servants. Equally, the damp river air and the smog of the capital aggravated William’s chronic asthma. Consequently, new palaces were begun in 1689 in the cleaner atmosphere of Kensington and at Hampton Court, where the adjoining park afforded opportunities for the hunting and shooting so beloved by the King. At Hampton Court, Sir Christopher Wren designed a wholly modern building, conceived as the centrepiece of a vast landscape. It was surrounded by large and elaborately designed gardens, the formality of which extended into the adjacent parkland where field archaeology has helped to establish original tree positions within the series of geometric avenues currently being restored. The Privy Garden lay directly in front of the new King’s Suite, and in 1690 the garden was widened in order to match the facade of the enlarged palace. The new garden had only a short life. Queen Mary died in December 1694 and William lost interest in Hampton Court for several years until a disastrous fire at Whitehall caused him to shift the main scene of court. In 1698 work restarted on the palace and by 1700 serious thought was given to its surroundings. In July that year William ordered the demolition of the Tudor water gallery in order that the Privy Garden could be extended to the Thames, and by November the gardener Henry Wise had begun to plan how the ground should be lowered to provide a view of the river. 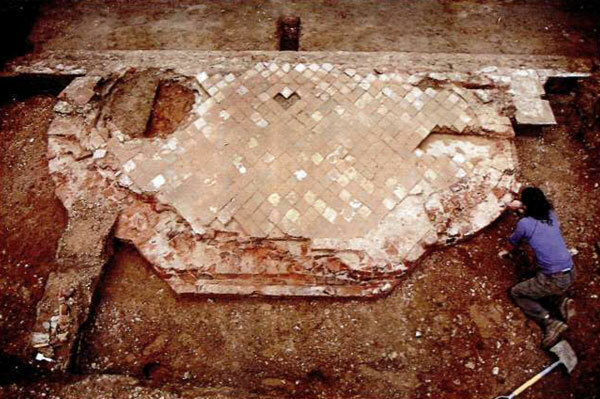 Substantial excavation appears to have been completed by the following February, and subsequently both William Talman, the architect, and Wise were involved in preparing ‘Sev’ll patterns to show His Majestye ye levell and forme of ye ground, how it should be laid out..’ A wooden model was made and in due course altered, while wrought iron screens designed by Jean Tijou were set up temporarily, alongside painted ash poles to represent the intermediate railings, so that the King could visualise their eventual appearance. The bedding trenches of William Ill's garden were perfectly preserved when they were reexcavated. They well reveal the complexity of the layout. Finally, on 16 June 1701 William decided what garden he wanted, and over the next eight months work proceeded with such speed that the new design was almost completed when the King died unexpectedly on 8 March 1702. 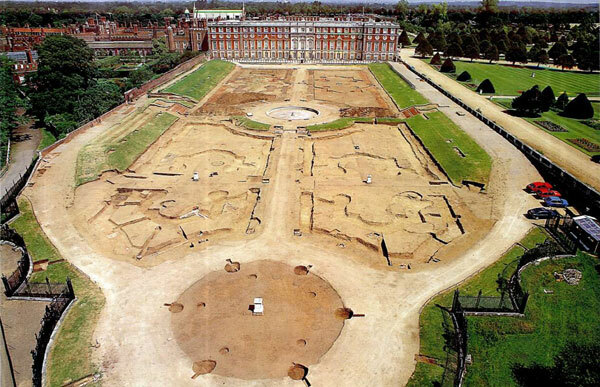 The creation of the garden began with huge excavations; the ground was lowered from ‘2 foot 8fi next ye house’ to at least ‘8 foot perpendicular’ at the far end so that the King could see the Thames from his palace. The overall scale of earthmoving was such that it swept away most traces of the earlier gardens, except at the sides, under the terraces. 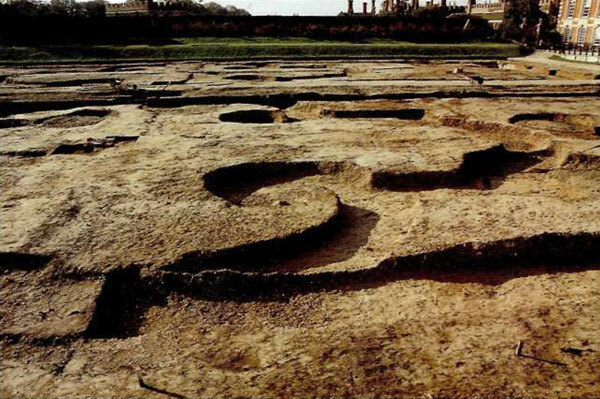 The excavated surface was covered with soil on which the new design was eventually laid out, with trenches being cut to make the borders. The trenches which formed the basis of the design of each quarter-plot were 2-3 feet deep and were wider than would be finally required. They appear to have been back-filled immediately, so that their sides were found to be as sharp as when they had been freshly dug. They were filled with good soil which had been specially enriched. Soil microfabric analysis has identified ashes, mortar and shell, as well as bone and possible latrine waste, which would both supply plant nutrients and buffer against acidity. An overlying layer of sandy soil was probably introduced to protect the roots of the garden plants from being ‘scorched’ when the fill was fresh. The broad plan of the trenches corresponds with contemporary illustrations and a survey now in the Soane Museum. Altogether they formed four plots around the cross-arms of an axial path which ran the entire length of the garden. The existing fountain basin appears to have been lowered to become a central feature and careful thought was given to drainage and the links between the different split levels. The finished flower borders, or platesbandes, were 6 feet wide and lined by dwarf hedges of box with narrow bands of sand outside. However the chief architecture of the garden was provided by the clipped evergreens: in the centre of each plot there was a series of yews clipped into pyramids. 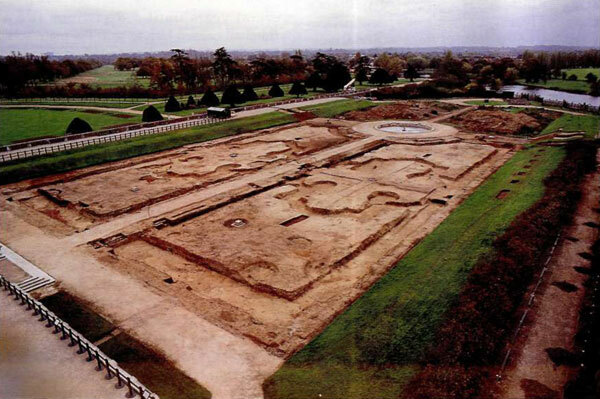 View of the Privy Garden with the trees removed and the garden as excavated ready for replanting. The individual quarters were finished with statues at the centre and with grass containing finely scrolled cutwork between the plates-bandes. A separate circle of grass was laid out at the southern end of the garden just inside the Tijou ironwork screens which separated the garden from the river. Around the outside there were alternate yews and round-headed hollies. The spaces between will have contained woody shrubs – including roses, sweet briars, syringas, honeysuckles and lavenders – with bulbs at the outside. The accounts survive of the supply of 2,000 tulips, 2,000 white narcissus, 2,000 crocuses, 800 hyacinths, and 500 iris, which all would have been replaced after the spring flowering by potted-on annuals and other flowers for summer and autumn display. Although the quantity of plants seems high, there was a large area to contain them and they may therefore have been thinly planted in accordance with the contemporary Dutch fashion. Archaeology made easy? Archaeology becomes somewhat different when you already have a plan of what you are excavating and know the date to within a matter of months. This plan of the gardens is part of a huge plan of the whole palace made in about 1712 and now in the Soane Museum. Within twelve years the adjacent corner of the garden was cut back, presumably to maintain access along the Barge Walk towpath which the river was eroding. In 1731 there was another substantial change when Queen Caroline, wife of George II, ordered the removal of the Tijou screens – and it would be another 170 years before they were restored to the garden. The cutwork of the parterre would have become gradually simplified, especially as the design began to lose form through constant recutting. At the same time the height of the main trees may have begun to increase, though they were probably kept in shape. The real disaster came in 1764 when Lancelot ‘Capability’ Brown was appointed gardens surveyor; and while he resisted naturalising the formal gardens ‘out of respect to himself and the profession’, it seems that the practice of clipping the evergreens was stopped. William’s garden was finally ruined. As the trees grew, the Privy Garden was in effect turned inside out. With subsequent Victorian planting the original grand vistas and geometrical plan of the garden became totally lost. Each quarter was set out with small openings which were linked by paths to draw the visitor within rather than allow viewing from outside. The evergreens had become so badly overgrown by 1891 that the walks and main path were ‘almost entirely canopied by over-arching boughs’, while extensive under-planting and low ground cover further obscured all the important features of William’s Privy Garden and its relationship with his palace. It is only now that the garden is reverting to its original formal appearance, and from early summer 1995 the visitor will be able to experience at first hand its rediscovered spirit.